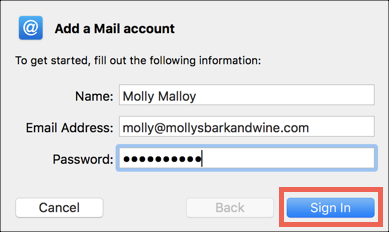 Learn how to set up your Workspace Email account on Apple Mail. Then you can send and receive business emails from your Mac. Note: This article is for Workspace Email only. For Office 365, see Set up my Office 365 email on Apple Mail (Mac); for Professional Email see Set up my email on Apple Mail . 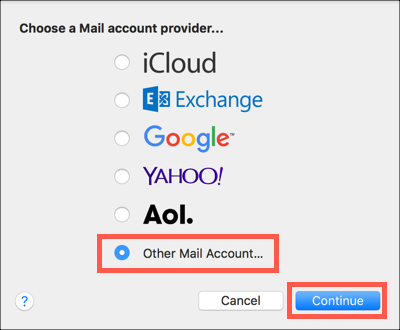 Note: First time setting up your Apple Mail account? See set up mail with your email account. Name Enter the name you want to display to others as the email sender. Email Address Enter your Professional email address. Password Enter your Professional email address password. 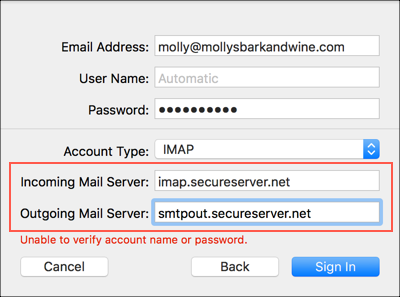 Note: If you see a message that says "Unable to verify account name or password," enter the Mail server settings and click Sign In. Click Done, your Workspace Email account will display in Apple Mail. Send yourself an email from your webmail, to test that you can receive mail in Apple Mail. Reply to that message from Apple Mail, to make sure your outgoing server works.